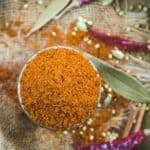 Dabeli Masala is an essential component of making Katchi Dabeli and the homemade version of this spice mix tastes delicious. Made using basic ingredients, this masala mix takes the Dabeli to a next level. Here is how to make Dabeli Masala Recipe at home. Dabeli literally translates to pressed. It is also known as Kutchi Dabeli due to its origin in Kutch region of Gujarat. Dabeli masala is the most important ingredient of the Dabeli, which is a popular street food originated in Gujarat, but also famous in Mumbai. Dabeli is a pav (bun) stuffed with tangy, spicy potato mix topped with this super delicious Dabeli Masala, pomegranate arils, sev and spicy and sweet chutneys. It is a super easy evening snack that you can make in a jiffy if you Dabeli masala readily available. Although you can Dabeli Masala in stores these days, but making it at home elevated the taste of the Dabeli a lot and you can be sure of the ingredients going into making it. Plus it’s much economical to make at home and you can make a big batch and refrigerate for later use. Dabeli masala is a special blend of aromatic spices that adds a balanced flavor to the Dabeli or any other snack that you use it in. To make this masala, everything you need will be easily available in your kitchen. Grated coconut is a must ingredient to get that grainy coarse texture. You can use it in many other recipes such as pulao, chat, mix vegetable, stir fries and more. You can make a big batch and refrigerate it in an airtight container for up to a month. Heat a pan and add coriander seeds, cumin seeds, fennel seeds and sesame seeds, cloves, peppercorns, cinnamon, star anise, black cardamom and bay leaf. Dry roast the spices until slightly brown. Make sure to roast the spices on low to medium heat so that all their flavours are released and they do not get burned. Now add dry red chillies and grated coconut in the pan and roast for another minute. Remove the pan from heat and let the mixture rest for some time. Let it cool down. 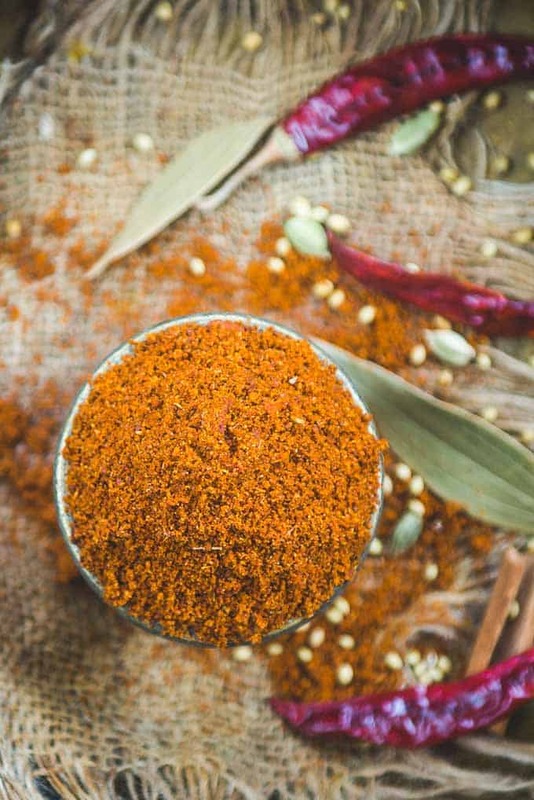 Once cooled down, transfer the mixture in a grinder along with black salt, dry mango powder, dry ginger powder and Kashmiri red chilli powder. You can increase or decrease the amount of dry mango powder, red chilli powder etc according to your taste preference. Now grind the ingredients to make a coarse powder. Transfer the powder in a bowl and add powdered sugar and oil and mix well using your fingers. Store this masala in an airtight container and use as and when required. Refrigerate for up to a month. Dry roast coriander seeds, cumin seeds, fennel seeds and sesame seeds, cloves, peppercorns, cinnamon, star anise, black cardamom and bay leaf until slightly browned. Add dry red chillies and coconut in the pan and roast for another minute. Remove the pan from heat and let the mixture cool down. Transfer the mixture in a blender along with black salt, dry mango powder, dry ginger powder and Kashmiri red chilli powder. Blend to make a coarse powder. Transfer the powder in a bowl. Add powdered sugar and oil and mix well. Store this masala in an airtight container. Refrigerate for upto a month.